The introduction to this guide is fairly long: click here to go straight to the instructions. To my surprise, I recently won a brand new Nokia N97 in a video competition. It’s a powerful device, so I was very happy indeed. The only problem was that I got an English N97, and in order to write in my native tongue I need our three additional Swedish letters (åäö), and they are naturally only available on the Swedish and Scandinavian versions of Nokia’s NSeries flagship device. I started thinking of how and if I could flash Swedish firmware on the N97 myself. 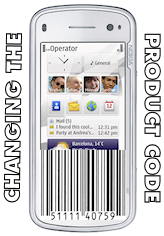 I remembered that when I rocked the trusty old Nokia N73 back in 2006, I considered changing the product code in order to turn it into the more attractive Music Edition. I thought that I ought to be able to do the same thing now in order to make Nokia Software Updater believe I have a Swedish N97. For a while I was leaning towards doing the entire thing manually: even flashing the firmware with JAF (Just Another Flasher) after having acquired the proper files with a tool called Navifirm – a process that is (vaguely?) described here. However, I JFGI and found and read about 15 guides – but none of them were quite satisfactory. They omitted important details, were unclear at times and they all seemed to tell different things. Finally I decided that the easiest and safest way to go was to simply change the product code, and then let Nokia Software Updater do the rest of the job. Here is my attempt at a no-frills, fail-safe and fool-proof guide to changing the product code on a Nokia N97 – in order to debrand it, change the language of the firmware or whatever your reason might be. This simple process will likely work on the Nokia 5800 (Tube) and most other Nokia devices as well. I made two version of the guide: one is short and intended for power-users and one is more detailed. 1. Make a Complete Backup of Your Phone. You’ll probably need to hard-reset your N97 after you’ve flashed the new firmware, so this is a must if you want to restore your phone’s content. 2. Select Your New Product Code from this list. If you want to unbrand your device, just choose an unlocked, standard firmware version from your country. The abbreviations CV and CB means “Country Variant White” and “Country Variant Black”. 3. Install and Launch the Software. You need two applications to change the product code: JAF and the JAF PKey Emulator. Google these filenames and download both apps: JAFSetup_1.98.62.exe and OGM_JAF_PKEY_Emulator_v 5.exe. Install JAFSetup_1.98.62.exe, launch OGM_JAF_PKEY_Emulator_v 5.exe and click on the GO button. This will start JAF. If you get any error messages besides Box Driver Not Installed which you can ignore, check the detailed guide below. Once JAF is running, click the BB5 tab. Tick the Prod. Manager option, then click the SERVICE button. Click on Read Values and enter your new product code in the text field at the top. Click the Write Values button and you’re done. 4. Flash the New Firmware with Nokia Software Updater. Softreset your phone first to make sure the new product code kicks in. 5. Hard-reset Your Device. After the new firmware is flashed, your phone probably won’t start. Don’t worry, this is expected. Just hard-reset your N97 by simultaneously pressing the Caps shift, Space, Delete and Power On buttons and it should start fine. That’s it! First of all, make a complete backup of your phone’s content in order to restore it later, because you most likely will have to hard-reset your Nokia N97 in the end. You can either do this by connecting your device to your computer using PC Suite (or OVI Suite) and make a backup with the Content Copier utility, or make a backup directly from your N97 by entering Main Menu/Applications/Office/File mgr./Backup, and then tapping Options/Back up now. Backups made with the File Manager will be saved to your phone’s memory card. To restore such backups, launch the File Manager and select Restore from the Options menu. Now it’s time to find out which product code you want to use. The product code holds the following information: the model of your phone and which firmware it is running, so by changing the product code you can also change the firmware with Nokia Software Updater. Select a product code from this list. If you want to unbrand your device, just choose an unlocked, standard firmware version from your country. The abbreviations CV and CB means “Country Variant White” and “Country Variant Black”. If you check the back of the battery on your device, you’ll see your current product code alongside your IMEI number. If you live in Europe, your product code will most likely start with RM-505. I recommend that you write down this code, because if anything goes wrong you may want to restore your N97 to its original state. Be aware that by changing the product code, you’ll void your warrenty. But in case you need to send in your phone for service, just restore your original product code and original firmware by following the steps in this guide, and the folks at Nokia won’t notice you’ve meddled with it. You need two applications in order to change the product code: JAF and the JAF PKey Emulator. Google these filenames and download both apps: JAFSetup_1.98.62.exe and OGM_JAF_PKEY_Emulator_v 5.exe. Run and install JAFSetup_1.98.62.exe which is included in the RAR archive above. The file OGM_JAF_PKEY_Emulator_v 5.exe needs no installation and is launched as it is. Launch OGM_JAF_PKEY_Emulator_v 5.exe. Don’t mind the settings and just click on the GO button in the upper-right corner. This will start JAF. If you get the error message Box Driver Not Installed – click OK and ignore it. Windows 7 and Vista users might also get the Not supported Windows version message. If you do, right-click on the file OGM_JAF_PKEY_Emulator_v 5.exe, open the Compatibility tab and use the option Windows XP SP3. To get rid off the Can’t load WinSCard.dll message, simply locate the DLL-file and kill it. Once JAF is launched, click the BB5 tab at the top. Tick the Prod. Manager option under Service Settings, then click the SERVICE button in the upper-right corner. Click the Read Values button, then copy & paste your new product code in the text field at the top. Double-check to make sure it’s correct. Click the Write Values button, wait for a second and then close the program. Now you’re almost done! Restart your phone, then connect it to your computer and launch Nokia Software Updater and follow the prompts. It should recognize your new product code and flash the corresponding firmware. After the new firmware is flashed, your phone probably won’t start. Don’t worry, this is expected. Just hard-reset your N97 by simultaneously pressing the Caps shift, Space, Delete and Power On buttons and it should start fine. More info on how to hard-reset the Nokia N97 can be found here. That’s it, voilà! Enjoy your new firmware. I’m rather confused. I did the change and translated my N97-Mini CVB to Spanish and everything seems to work fine. The issue came up when I tried to connect to the 3G service here in Argentina. Seems that there are some parameters that are related to Europe countries vs American countries. It’s likely that flashing the wrong firmware can disable 3G. And you’re sure that the actual hardware supports Argentinian 3G? If so, I suggest you do the entire process all over again, and make sure you select a product code from Argentina, or from a Spanish speaking country that you’re certain uses the same frequencies. Good luck! Hi. Managed to debrand my Nokia 6500 slide from Orange in UK. I used the DCT4 tab instead of BB5 tab, initially missed the part of switching phone off after changing code. Any thanks for the info as l just wanted to do it for fun and it was successfull. I actually asked the Swedish Nokia support department what product code they have on their N97s, and I used that one. Maybe you can help me with this one as well. Do you know what is the difference between a CV (country variant) and EMEA? Yes, I did get a few problems with the hardware QWERTY actually. I can type all characters, but they are not always located where the keys say they are. And I have to use the Symbol Screen to insert commas. It’s no problem once you get used to it, though, and besides those minor inconveniences, the keyboard works like a charm. Didn’t you have problems with the keyboard? I know that depending on the country, keyboards are different. I want to include Spanish among the list of available languages in my phone, I have a Dutch phone (I believe the same keyboard layout as in UK). It’s very difficult to find out if any of the firmwares has both the keyboard layout that my phone has, and the Spanish language. Any ideas? I was also looking the method of changing the product code on a nokia N97 and finally find the best solution with the help of your post.